Miss Mary G. Walsh, 89, died Saturday at the home of her sister, Mrs. Frank L. (Julia) Werner, 412 Magruder Street, city, with whom she resided. Born March 8,1893, she was the daughter of the late William Walsh and Mary (Concannon) Walsh. Miss Walsh was synonymous with the library system here, having served as a librarian from 1924 to 1963. She attended Notre Dame High School, Baltimore, and Notre Dame College, also in Baltimore, and received a degree in library science from Columbia Teachers College. Miss Walsh taught French in the old Allegany County Academy and also at Allegany High School. She worked in the library system first at the Cumberland Free Library on Greene Street and then when the library moved to its Washington Street location she continued as the librarian there. 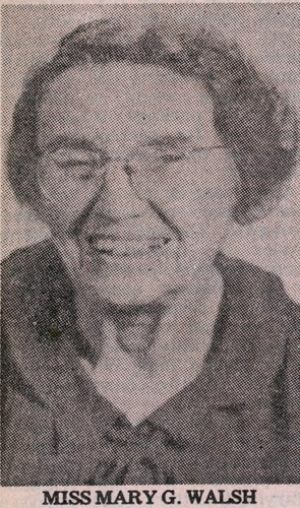 She was working in the early 1960s when the county took over the library system and the main library became known as the Allegany County Library. She was a member of St. Patrick's Catholic Church and the Sodality. She also was a member of the National Federation of Business and Professional Women's Clubs Inc. and a member of the Soroptimist Club of Cumberland. Surviving besides Mrs. Werner is another sister. Sister Mary Joseph Walsh, SSND, presently at the Villa Maria Retirement Home. Miss Walsh was one of nine children in her family. Among those who preceded her in death were Bishop James E. Walsh, who as a Maryknoll bishop was imprisoned in Red China and eventually released. He died in August of 1981. Another brother. Rev. John Walsh, who died in 1967, also was a member of the Maryknoll order. Also preceding her in death were another brother, Judge William C. Walsh, former Attorney General of Maryland, who died June 17, 1975; Sister Rosalia Walsh, a member of the Mission Helpers of the Sacred Heart, Towson, who died in January, 1982; and a sister, Miss Margaret Walsh, who died in 1974. Miss Margaret Walsh Worked with Miss Mary Walsh in the library system. Friends will be received at the Scarpelli Funeral Home Sunday from 7 to 9 p.m. and Monday from 2 to 4 and 7 to 9 p.m.